Restoring a beautiful vehicle after long periods of inactivity and many decades of rust and dents is a tough job to say the least. Whether it’s a 1920 Ford Model T truck or a 1907 Cadillac Model H, when it comes to restoring, almost everyone has an opinion on what to replace or repair, from the engine, to air-conditioning, to truck floor mats and seat coverings. 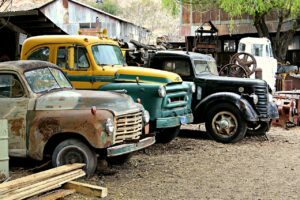 Despite their historical or sentimental value, vintage cars and classic trucks require some degree of restoration. Interior items and old engine parts that are as old as the first Sherman tank need to go. For those who want to buy vintage cars and trucks, it is important to note that most these classic autos are sold as they are, which sometimes means 35 or so years with no maintenance of any kind on the vehicle. Vintage cars and trucks are usually in varying conditions and needing different levels of repair. Sometimes, seat covers are in tatters, while their engines are coated with layers of grime and gunk. First and foremost though, a vintage car should be registered as a historical vehicle with the Classic Car Club of America. By definition, an automobile built between 1925 and 1948 is considered a classic by the said organization. However, a petition can be made by the applicant if their car does not meet certain specifications yet satisfies most of the group’s requirements. Now for the restoration part — Restoring vintage car accessories like shift sticks, steering wheels, and car floor mats is not as hard as most tend to think. Many auto shops have opened specifically to cater to such needs. However, when restoring a vintage truck or car to its former glory, one needs to have some good contacts with regards to auto parts. Finding genuine auto parts for older models can be very tricky. Extensive research on the car’s model and maker is necessary to make sure the car owner gets the right replacement parts at a good price. Fortunately, an increasing number of auto parts manufacturers are now producing a line of replacement parts for old auto models. Most replacement manufacturers turn up at car shows and the like. Such events provide a venue for car aficionados to exchange information such as where they can get great deals on car floor mats and vintage accessories to fit their classic cars. Today, drastic changes like rebuilding the transmissions or replacing engine valves to make them fit for drag racing purposes seem to be the trend. Making changes to the interior like seat covers, sound systems and truck floor mats are also being practiced. While these trends are being done mostly by modern car enthusiasts, car purists tend to be stricter on the restoration process. Minute details on car seat covers, seat belts, upholstery, and car floor mats are just a few that this group of car collectors want replicated, down to the last details. While car enthusiasts and experts can do restorations and modifications themselves, like creating exact replicas of truck floor mats and seat coverings, major types of work are often left to restoration companies. A vintage car’s frame can be easily damaged when removing rusted or frozen bolts, so the utmost care is required. While having vintage car restoration experts revert your car to its heydays can be costly, no amount of money can top the feeling of owning a vintage car. Driving around in a 1928 Bentley Le Mans Tourer, matted with the exact replicas of 1928-era car floor mat and seats upholstered in classic leather, is definitely something to be proud of. Dan Bodrero has owned and operated his own store, manufacturing and selling seatcovers anddashboard mats for nearly every make and model of car truck or SUV. Dan takes pride in the quality of his workmanship. Each custom made seat cover is hand crafted from quality materials and is guaranteed to protect your automobile and fit securely and snugly.